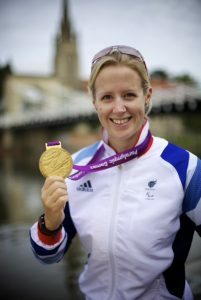 IN-vision, the charity furthering research into Infantile Nystagmus (IN), is delighted to announce that reigning Paralympic and six-times world champion rower, Naomi Riches MBE, has agreed to become its first Patron. After retiring from the sport in 2013, Riches was keen to find new experiences and ‘give something back’ and we hope that this position will help her fulfil those ambitions. Naomi, who has nystagmus and cone dystrophy, is already involved in a number of other charities* and feels that the role of Patron for IN-vision is a wonderful way to help those who are affected by a condition she shares and understands. Through Naomi’s support it is hoped the charity will be able to raise the profile of the condition, so that it is more widely understood, both by those it impacts and those it doesn’t. For more information on the charity and its work, please visit www.in-vision.org.uk. If you would like to get involved with the charity, volunteer or fundraise please email info@in-vision.org.uk.